You are here: Home » Stop, Drop, and Roll! 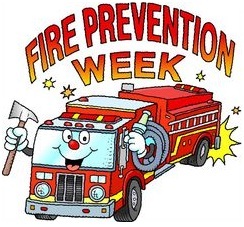 Next week, from October 9 – 15th, we celebrate Fire Prevention Week. This is the time when we spread awareness of fire prevention practices and honor our Fire Fighters across the country. Exactly one hundred years ago, the Fire Marshals Association of North America (FMANA) sponsored the first Fire Prevention Day on October 9, 1911. This happened to be the 40th anniversary of the Great Chicago Fire, which took place back in 1871, and burned for over 27 hours, taking the lives of over 300 people. In 1922, Fire Prevention day became a week-long celebration of our Fire Fighters and the memory of those who were lost. Today, schools use this week to teach prevention and fire safety to children. They are taught how to test smoke detectors, how to find the easiest escape route from a building, they learn to always stay low when evacuating, and let’s not forget the good old “Stop, Drop, and Roll!” As adults, we use this week to thank the firefighters in our lives for everything they do. So, if you know any firefighters, be sure to express your thanks this week for putting their own lives at risk to save others. And, speaking of fires and hot places, be sure to check out our mesh chef coats so that you can stay cool during all of those long days cooking in that sweltering kitchen! And you won’t find a better selection or price than at ChefUniforms.com! ← Win Some Extra Cash for the Holidays from ChefUniforms.com!